LG G7 One appeared at IFA 2018 almost half a year ago. In the closing weeks of 2018, the phone arrived in Japan as the LG X5, but today is the day it finally reached South Korea. The phone is named LG Q9 One and comes with 64 GB storage, while all the other specs are unchanged. LG Q9 One has a 6.1 QHD+ screen with a tall ratio of 19.5:9. It runs on the two-year-old Snapdragon 835 chipset that brings along Quick Charge 3.0, Bluetooth 5.0 and all the Wi-Fi 802.11 channels. RAM is 4 GB, and the storage can be expanded even further with a microSD slot. The camera on the back is 16 MP with f/1.6 aperture, LED flash, PDAF and laser AF. The selfie shooter is 8 MP f/1.9 with a wide-angle lens. The most distinctive feature of the phone is actually the stock Android it runs. LG says it ships with Pie out of the box. The phone will be available only on the LG U+ carrier. It has a KRW599,500 price tag, which is about $535/475. 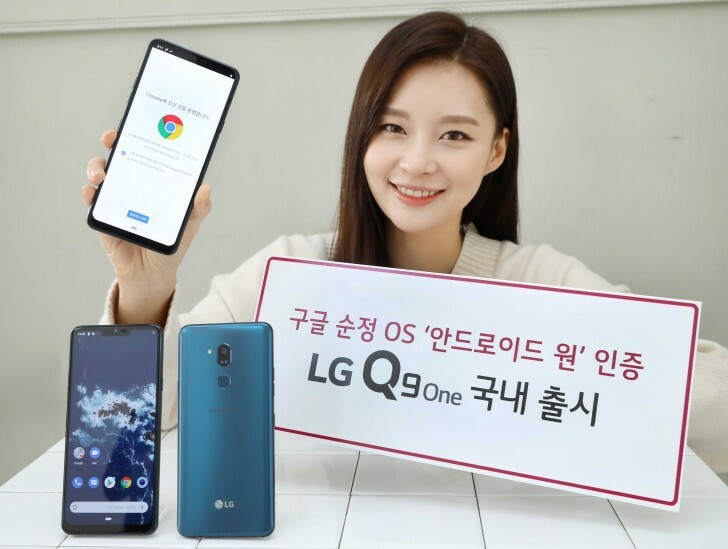 Although colors are not officially announced, the press release is filled with photos of New Moroccan Blue units, so theres a confirmation for the only interesting color of the LG Q9 One.